The Cumberland & Dumfriesshire Farmers Mart P.L.C. had forward 69 prime cattle, 2 young bulls, 16 over thirty month cattle, 12 spring lambs, 3,657 prime hoggs and 3,115 cast ewes & rams at their weekly sale at Longtown on Thursday 29th April, 2010. Clean cattle were cheaper on the week. Top price of 179.5p for a Limousin heifer from Toppin Castle. Limousin bullocks from Englishtown sold to 172.5p. Charolais bullocks £1,214 and £1,202 Sceughdyke. Limousin heifers £1,173 and £1,167 Haining House. A smaller show of OTM cattle was forward, grassing cattle again met a brisk selling trade. Top price of 116.5p for a Charolais bull from D. & P. Roddam, Fordlands. Bullocks to 115.5p for Charolais from Fordlands. Heifers to 109.5p for Limousin from Fordlands; Angus 96.5p Scugg House. Cows to 113.5p for Limousin from Sceughdyke, 111.5p Burnfoot on Esk, 109.5p Howard House; Angus 112.5p Burnfoot on Esk, 103.5p Doorpool; Shorthorn 93.5p Minsca; Friesian 81.5p Kinkry Hill. A smaller show of 3,657 prime hoggs saw the sale level out at 191.2p per kilo with good fleshed export types very dear and short of buyers requirements. Top price of 224p per kilo for Texels from Messrs Wilson, Blackrigg and to £129 per head for Charollais from Messrs Kennedy, Wester Parkgate; Texel £110.50 West Millhills, £103 Hobbiesburn, £100 Ericstane; Beltex £103 Wester Parkgate, £96.50 Ericstane; Suffolk £96.50 Golden Lane, £95.50 Sceughdyke; North Country Cheviot £94.50, £90 Ericstane; Half Bred £91 Ericstane; Hill Cheviot £89.20 Golden Lane, £87.50 Falnash; Blackface £88.20, £86.80 Smalmstown, £85.80 Oswie; Greyface £87.20 Plumpe, £85.80 Sockbridge Hall; Swaledale £83.20 Willimoteswick, £73.50 Settereth Park; Lleyn £75.20 Barvernochan; Herdwick £72.20 Millbeck; Jacob £69.50 Branteth. The 699 lightweight hoggs sold to a top of £75.80 and £69.80 for North Country Cheviots from Kilfinnan; Blackface £73.10 Kilfinnan, £68.80 Barlaes; Texel £71.50 Newbigging, £69.50 Butterdales; Shetland £69.20 Kilfinnan; Greyface £68.50 Settereth Park; Swaledale £66.50 Settereth Park; Herdwick £65.80 Kilncroft; Hill Cheviot £62.80 Dockray Hall. A smaller show of 3,115 cast ewes and rams sold to the usual full ring of buyers and trade was similar on the week for all classes. Top price of £151 for heavy Suffolk ewes from Golden Lane, others £149 Rashee; Texel £139 Newbigging, £135 Rashee; North Country Cheviot £129 Biggin, £95.50 Ericstane; Charollais £117 Roadside, £113 Rashee; Half Bred £117 Fossway; Leicester £103 Nunscleugh, £95 Severs; Bleu d’Maine £101.50 Branxholm Town; Rouge £99 Rashee; Zwartbles £98 Coytre; Greyface £87 Bogues and Sceughdyke, £85 Cairnside; Beltex £79 Winterhope, £75 Hobbiesburn; Cheviot Mule £78 Falnash, £75.50 High Stenries; Dorset £73 Golden Lane; Wensleydale £71.50 Winterhope. Hill ewes to £85 for Cheviots from Winterhope, £75 Whinfield; Blackface £77 Edges Green, £73.50 Greensburn, £67.50 Shitlington Hall; Lleyn £73.50 Settereth Park; Swaledale £70.50 Coombe Crag, £64.50 Whinfield. 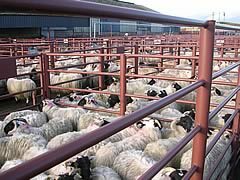 Rams to £146 for Leicesters from Nunscleugh, £89 Edges Green; Texel £136, £131 Severs; North Country Cheviot £129 Biggin, £94.50 Cairnside; Charollais £126 Rashee and Golden Lane; Suffolk £125 Severs, £116 Fossway; Bleu d’Maine £99.50 Branxholm Town; Hill Cheviot £71 Kilfinnan; Blackface £69.50 Barlaes.